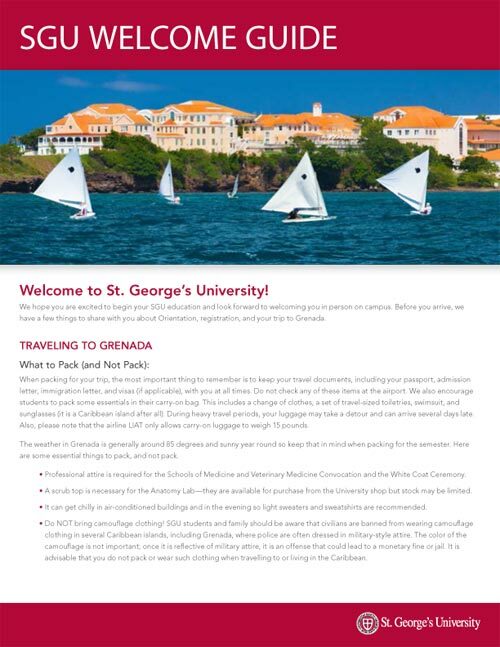 There are plenty of ways to get around the University and Grenada. Below is some useful information regarding getting around by bus, renting a car, and obeying traffic and parking regulations—both on and off campus. The main form of travel is by the University bus; buses run regularly from 7 am until 2 am between the True Blue and Grand Anse campuses and to the Lance-Aux-Epines, Mont Toute, Frequente, Point Salines and True Blue areas where many of the off-campus students live. There is no charge to take the University buses. Schedules are displayed at the True Blue campus and next to the bus stop. You can also download or print the schedule from the Transportation Community on Carenage. Please note that there are separate schedules for weekdays and weekends. On holidays, buses run on a weekend schedule, unless otherwise stated. City buses run from the Grand Anse area into town. These are an inexpensive, fairly quick way to get into the city of St. George’s. The destination is the Esplanade, near the market in St. George’s. There are many marked bus stops along the route with the final stop being the Melville Street Bus Terminal in the city. A one-way fare to any point along the route is $2.50 EC. Buses are very common during the day, but fewer buses run after 11 pm Monday through Saturday, and fewer still run after 4 pm on Sundays, so plan your activities accordingly. Buses to other towns around the island (Gouyave, Sauteurs and Grenville) depart from the Melville Street Bus Terminal. There is no fixed schedule. Taking one of the buses offers a good chance to mix with the local population. Fares are set by the Government, most are less than $6 EC each way, but verify the fare before you get on. Buses for each destination have a fixed embarkation point in the terminal and each bus has a route sticker on the front windshield. Many buses stop running in the early evening though, so make sure to return in plenty of time. Many drivers are eager to accommodate groups of students and will arrange group rates for short trips or provide transportation to social events during off-peak hours, which is helpful in the evening. Taxis are generally the transportation of choice when coming or going to the airport or when stranded at night. $35 EC is the standard charge to or from the airport. There are several car rental agencies in Grenada. These agencies offer a variety of cars and 4WD vehicles with either standard and automatic transmissions. Many students get together in a group and rent a vehicle for the term. The rate for motor vehicle rentals can range from US $400-$600 per month. Some students, particularly upperclassmen and those living off-campus, choose to buy used cars to get around the island. 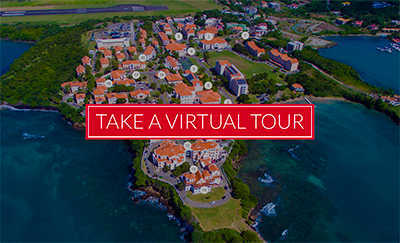 Students leaving the island will often post these sales on the SGU marketplace. If you decide to purchase a car we recommend considering a car share with other students to supplement the cost. Please note that all vehicles must be registered with both the Grenadian Department of Motor Vehicles and the University’s Department of Public Safety and Security. All drivers must have a Grenadian driver’s license. Please see below for more information on how to obtain one. In order to drive a car in Grenada you must have a Grenadian driver’s license. 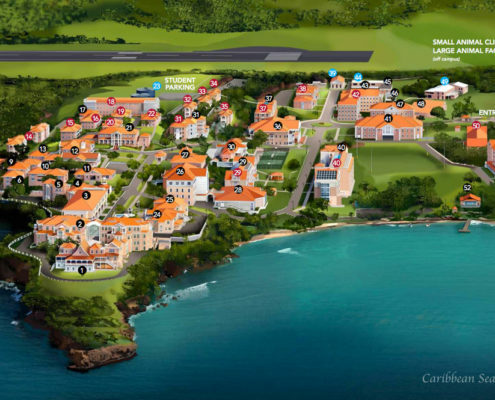 Students with a valid driver’s license from their home country can get a temporary driver’s license to drive in Grenada. In order to obtain a temporary Grenadian driver’s license, students should visit the Grand Anse or St. George’s Police Station carrying a valid driver’s license from their home country. The cost is EC $60. Temporary licenses are only valid for three months, and it is essential they be renewed prior to expiration. Please do not drive yourself to the police station in order to obtain a license without a current, valid Grenadian license. This is a serious offense and can result in incarceration. * International driver’s licenses are not valid in Grenada. All drivers on campus are required to abide by all motor vehicle rules and regulations. For more information on rules and regulations, parking, and violations, please refer to your student manual or visit the Department of Public Safety and Security Office for the latest Motor Vehicle Rules and Regulations pamphlet.